For breakfast, I had kimchee and rice, two eggs, an apple, yogurt drink, a yogurt, and a rice cake like food. Today we picked the 4th Aunt up around 12:30 from her business. We go to see her cute puppies! Then we went to Ommas shop, and had a bulkogi burger sandwiches around 11. We spent the day visiting Ommas pottery vendors in an area where pottery is prominent, one lady has been on KBS and showed me how they make the pottery and how she paints the designs. Then we went to see a friend who also owns a pottery shop and had lunch with her around 3pm. Then we went to another vendor to get some pieces for Omma’s shop. We also went to another shop that had fine China. Of course the one I liked was $500 for the set and the didn’t sell the pieces separately (the photo below, lower right hand side). I had said earlier on the trip that I wanted to get some wedding ducks, and this shop had some, so my 4th Aunt bought two pair, one for my mom, and one for me. So sweet. We met my 4th Aunt’s Husband (이모부) at a Chinese restaurant for Dinner called Shanghai Moon. We had two dishes, and each came with a carved carrot. 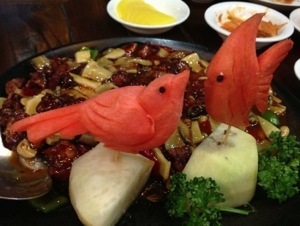 The first dish had a bird, and the second a fish. After dinner we all went to AK Plaza Mall. My Aunt and husband wanted to buy me shoes. I was afraid there wouldnt be anything for my large american feet -haha. I was able to look up and down and pick something I liked which I think (and really hope) they ordered the correct size for me. The pair of shoes I tried on was a bit tight, so they ordered me the next size up, but when they translated the size, I’m not sure if that is correct now. I didn’t have internet at the mall so I couldn’t look up the correct size -aaaah! The new shoes arrive on the 28th. I really hope they are just right. Below, were some funny mannequins at the mall. We stopped off at Paris Baguette (which is popular in Korea) to get a Cake for Christmas and mom got me Chocolates ^^ We ate the cake with MinJee at the house and her friend who was over before they both left. It was a sweet potato cake that was yummy, and had a whipped cream instead of icing. Kind of like the mini cakes at the Chinese restaurants in the US – light and fluffy and not overly sweet.